Totel Football is fantasy football experience that lets you select players from the biggest leagues in Europe. It offers players the chance to participate on a weekly basis or across an entire season, with guaranteed prize pools of up to £100,000 to be won. Find here how to play, rules and tips. FANTASY FOOTBALL TOTEL FOOTBALL Players accumulate points on a number of aspects of their performance, from minutes spent on the pitch to goals scored, assists and so much more, while a booking or sending off could see their points total plummet, so pick your team wisely. Each week you have the opportunity to select players from all the top leagues such as the: Premier League, La Liga, the Bundesliga, Serie A and also the Champions League. You can stake as little as a £1 on your team and your stake enters a prize pool. The amount you stake determines the amount of payout you will receive should you have selected a winning team. Once the week has ended and all the possible games played, if your team is in the 10 per cent of all teams entered, you will win your share of the prize pool. If you love to bet on the football and your football knowledge is good then Totel Football is great fun and your own football knowledge can bring home the cash. 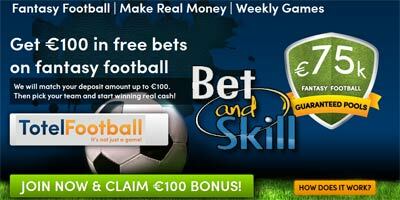 To top it off BetAndSkill readers can get up a £100 in free bets just by registering from our banners or links. PICKING YOUR TEAM AND FORMATIONSelect your players simply by clicking on player names in the player list on the right hand side of the page. Depending on the competition you will be able to pick 2 or more players per club side for your team. If you exceed this quota, you will be deducted 5 points per player over quota. Any penalties that your team has incurred are displayed in the area below the pitch. Each team will have 4 substitutes. If any of your team players do not play in a competition, then we will automatically replace that player if you have a substitute player available who plays in the same field position. Your selected players accumulate points based on their performance, real-time updates allow you to track how your team is getting on and the likelihood of a cash payout. Experience the thrills and spills with other fantasy managers by contributing to our discussion boards. Stake money collected creates a prize pool. 30% of the total prize pool will be retained to cover operational expenses. There may be further deductions to return voided bets to customers in the case of match cancellations. Please be aware that the advertised total prize pool is at all times referred to before any deduction has been made. The top 10% of teams will share in the prize pool. The higher your team finishes in the competition, the more points that you will accumulate per £1 you staked on your team. Totesport divide the pool by the total points accumulated by all winning managers in order to calculate the dividend to be paid per point accumulated. Each winning manager will then be paid out the per point dividend x total points accumulated. For example, a total prize pool is £25,000 with a total of 5,000 points accumulated by all winning managers. This will result in a payout per point of £5.00. You finish 1st having invested £1 on team entry, your payout will be £500. You finish 1st having invested £10 on team entry, your payout will be £5,000. You finish 4th having invested £10 on team entry, your payout will be £1,000. You finish 36th having invested £100 on team entry, your payout will be £1,500. Your winnings will be deposited into your betting account.